August 2014 – Letter to UIUC Chancellor Phyllis Wise in support of Professor Steven Salaita, fired by the University of Illinois at Urbana-Champaign for criticizing Zionism and Israel. August 2014 – Endorsement of the “Stop Israel at the Port! Zionism isn’t welcome in our Town!” action in Oakland, California scheduled for August 16, 2014. May 2014 – Letter to San Francisco State University President Leslie E. Wong in support of Ethnic Studies Professor Rabab Abdulhadi, who has come under attack from right-wing Zionist pressure groups. 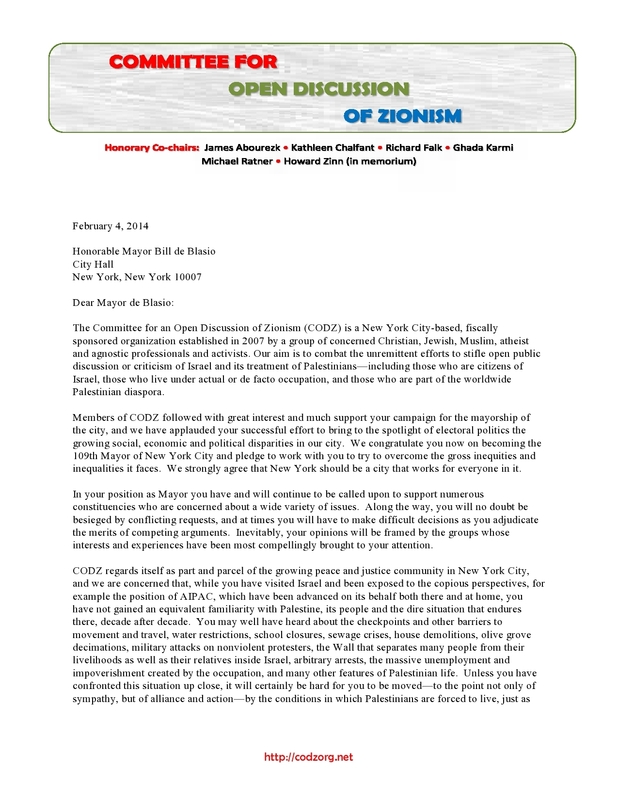 February 2014 – Letter (p. 1; p. 2) to New York City Mayor Bill de Blasio inviting him to visit Palestine/Israel, following his declaration to AIPAC of his unflagging support for Israel. 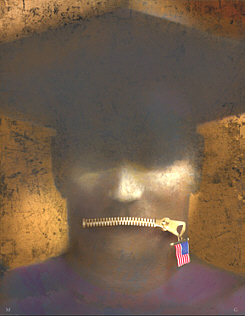 February 2014 – Open Letter to the New York State Assembly and Governor Andrew Cuomo asking that they not pass A.8392, a bill that would defund state-run colleges and universities that spend state monies on faculty participation in academic organizations which have endorsed boycotts of countries that “host” New York State institutions. December 2013 – Endorsement of an Open Letter to Tel Aviv University calling for a boycott of the academic conference, “10th International Tel Aviv Colloquium on Cinema and Television Studies: Cinematic Traces of Things to Come,” sponsored by the Tel Aviv University Department of Film and Television. December 2013 – Endorsement of a petition issued by the U.S. Campaign to End the Israeli Occupation thanking the American Studies Association National Council for voting to endorse and honor the Palestinian civil society call for the academic boycott of Israel. 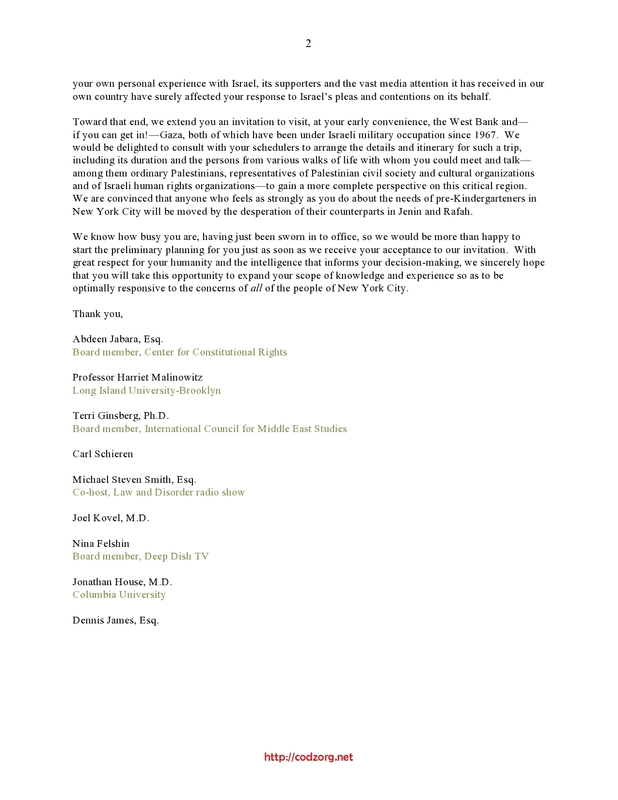 December 2013 – Endorsement of the Al-Awda New York Solidarity Statement in support of Al-Awda-NY, the Palestine Right to Return Coalition as it defends itself in a civil lawsuit aimed at targeting and persecuting community activists and leaders through the coordinated efforts of state agents and Zionist organizations. December 2013 – Endorsement of the Complicitats que maten/Complicities that Kill Manifesto against the collaborative agreements between the University of Vic (Catalonia) and Israeli universities. October 2013 – Endorsement of petition to U.S. Attorney Barbara McQuade requesting, in solidarity with the Arab American Action Network, that she stop the federal indictment of, and drop immigration fraud charges against, Arab American activist and organizer Rasmea Yousef Odeh. August 2013 – Endorsement of “Do Not Apply” to Hebrew University Open Letter requesting that scholars respect the academic boycott of Israel and refrain from applying to a tenure-track faculty position opening in communication and journalism at the Hebrew University of Jerusalem. Pingback: Two more letters to Mayor de Blasio | Jews Say No: Not In Our Name!